When faced with tall and huge hedges, the last thing you want to do is limit your workspace and this is why cordless pole trimmers with extended reach are so important. These devices combine two benefits with the first benefit being the added height of the pole and the second being the enhanced portability thanks to their cordless nature. It’s no wonder experts from around the world heavily recommend going for the best cordless pole hedge trimmers especially when convenience and versatility are of great importance. Which Trimmer of The 9 Reviewed is The Best? Hedge trimming is one of those crucial tasks you cannot afford to compromise on. If you make the mistake of letting your hedge overgrow, you risk facing a nightmare trying to get it under control once again. So, ditch the ladder, forget the strain and focus on getting yourself one of the following handy tools for the job. This powerful cordless trimmer comes with a 20-inch blade that’s capable of cutting branches as huge as 5/8-inch in diameter. Thanks to this ability, you can bank on it to slice through some serious timber every so often. Most importantly, its head is easy-to-adjust meaning you can conveniently switch from cutting the top crop of your hedge to the sides. We can confidently say that this trimmer is versatile and, therefore, ideal for handling smaller hedges. Most importantly, it is light in weight meaning you can conveniently carry it around for several hours without straining. To top it all up, this machine is protected by a 4-year warranty which covers workmanship, parts and material defects. Another plus with the GreenWorks 40V is that it operates quietly meaning you can operate it even in a residential without worrying about disturbing your neighbors. Let’s also not forget the fact that this machine comes with a 2AH battery which is powerful enough to trim up to 350 yards in runtime. Light in weight and easy to operate. Powerful yet safe to operate. Battery recharges quite fast (roughly 40 minutes). Generally well built and aesthetically appealing. Difficult to control the further you extend the pole. Learn More: For walk behind string trimmer visit here and for electric hedge trimmer visit here. And for poodle lovers. VonHaus Cordless Pole Hedge Trimmer has made lawn care more manageable. It features a 40Voltages motor with a 20-inch dual action blade for effortless and precise cutting. The trimmer has an adjustable telescoping pole that extends between 83.8" and 107.5”allowing you to reach high hedges and other hard-to-reach spots. Also, it is light at 11lbs, and it has an ergonomic handle for easy carrying and operation. You can, therefore, operate this trimmer for many hours without getting fatigued. It has a two-stage lock to prevent accidental start-ups. The trimmer has four pivoting heads. Therefore, you can trim at various angles. The battery gets fully charged in 75 minutes, giving you about 45 minutes of running time. High powered motor at 40 voltages. Battery operation time of 45 minutes is too short. But soon this will not be the case as soon as spare batteries are available. LPHT120 BLACK&DECKER Cordless Pole Hedge Trimmer is equipped with a 20-voltages Max lithium-ion battery for cutting power. The battery is more durable and is designed to retain its charge five times longer than NiCad batteries. It features a dual-action 18-inch steel blade which has 40% less vibration, therefore, reducing machine operator fatigue. The blade is robust and able to cut branches that are up to 7/16-inch thick. The pole has a trimming length of 6-1/2 feet which makes it possible to trim hedges that are up to 11' high. It has a safety lock-switch button to prevent accidental start-ups. The trimmer has a light-weight construction of 7.7 pounds for easy carrying, operation, and less fatigue. Besides, the trimmer has a five-position pivoting head that can do 180 degrees allowing you to trim at multiple angles. The package includes a battery and a charger(Energy Star-qualified). Reduced user-weight at 7.7 pounds only. Limited battery run time of 40 minutes only. DCHT895M1 DEWALT Cordless Pole Hedge Trimmer features a powerful motor with 3700SPM. The trimmer is equipped with a 22” steel blade for efficient cutting and durability. It is designed with an adjustable pole with various lengths between 45” and 70” length, therefore, extending your reach. The trimmer’s articulating head has eight operating positions to offer you multiple trimming angles. Its battery has a 90 minutes runtime long enough to cover enough area. When you make an order, you will receive the DCHT895 Pole Hedge Trimmer, 40V MAX 4Ah Battery, a Charger, Shoulder strap and Blade cover. The battery has a 90 Minutes run time. Eight operating positions for the head. It is a little bit heavy at 15.8 pounds. The PH40B210 Greenworks Cordless Pole Hedge Trimmer is a powerful trimmer with a 40 Voltages motor enabling you to trim so much area in little time. The trimmer is equipped with a dual action, 20 inches steel blade for optimum cutting power and long-life. It has a cutting width of 5/8-inches. Also, the trimmer has an adjustable 3-position pivoting head for maneuverability during trimming. What’s more, the machine has a mechanism to reduce noise helping to reduce operator fatigue. The device weighs 9.4 pounds. When you order you will receive the Cordless Pole Hedge Trimmer, a 2.0 AH Battery, and a charger. A powerful 40 Voltages motor. A powerful dual action steel blade. Wouldn’t it be great to cut down your trimming time? GTS4002C Sun Joe is a three in one gardening kit powered by a 24 Voltages motor for efficiency. It features a 5.3 feet extension pole with three adjustable and interchangeable tools. The tools are a 10-inch string edger/trimmer, 17.7-inch pole hedge trimmer and an 8-inch pole saw. The tools can be interchanged quickly for convenient use. The tools can handle trees, shrubs, bushes, and weeds. Using this tool will see you manage various landscaping challenges. The 17.7-inch pole hedge trimmer length is enough to reach high and low hedges. You will saw logs, trim plants of different diameters and heights among others lawn jobs. Recharging the battery takes only an hour. Easy to operate it and interchange the heads. 24 voltages is a bit low power for such a multi-functional tool. GCPHT08 GARCARE Pole Hedge Trimmer is powered by a 20 Voltages motor with a 2.0a battery reliable battery for trimming effectively. It will, therefore, trim small and medium-sized branches and twigs efficiently. The blade is 20 inches long and has a 5/8 inches cutting width and therefore cuts smoothly and quickly. The battery takes one hour to get fully charged. The pole is made from aluminum and has an extension of 9.2 feet to reach high length hedges and far spots. The pivoting head has 6-trimming positions for maximum maneuverability. It is easy to operate this machine with its soft rubber handle for a comfortable grip during trimming. 6-positions on the pivoting head. The tool capacity can’t handle very tough jobs. The LPHT12417 runs on a powerful 24V battery which is strong enough for tough cutting jobs. Besides that, this superb machine from Earthwise comes with a 17-inch steel blade which easily cuts its way through branches as thick as 5/8 in diameter. This is the convenience you need to handle large amounts of workload with no qualms. The adjustable trimmer head has six cutting positions for multiple angles during trimming and therefore being able to reach hard-to-reach areas and tall hedges. The battery takes one hour to get fully charged. What’s more, it comes with a shoulder strap which helps in weight distribution across your entire body helping you maintain control over the equipment and balance. The package includes the trimmer, a battery, a charger, shoulder strap and a blade cover. Best of all, this trimmer is backed by a 2-year limited warranty. Adjustable trimmer head for six cutting positions. The motor is less potent than other cordless pole hedge trimmers at 24 volts. You should never settle for less when it comes to trimming tall bushes, shrubs, and hedges. The NBCYHTS comes with a powerful 2.0Ah which has a superb runtime and recharges quick. In fact, it takes roughly 1 hour to achieve a full recharge which is enough to ensure you’re back in session as quickly as possible. Above all, this little monster comes with 20-inch dual-action blades that deliver less vibration, unlike single action blades. Above all, the trimmer is rather aggressive meaning it easily slices through thick branches of up to 5/8-inch diameter. And it’s not just about making cuts – the thing with this trimmer is that it makes clean cuts quickly. For added flexibility, this trimmer comes with a 6-position head which allows you to make cuts from multiple angles. What more can a creative landscape wish for? To make the deal even sweeter, this high-end hedge trimmer comes with an aluminum telescoping tube which can be extended to scale heights of up to 9.2 feet. This extended reach, along with a soft rubber grip makes for a wonderful yard sculpting masterpiece. Last but not least, we liked the fact that this trimmer is well designed. In fact, it comes with high-quality shoulder belts and blade covers which come in handy in ensuring your trimmer lasts long. Powerful blade for smooth cuts. Operates quietly with minimal vibration. Pivoting head is super convenient for cutting. Tall enough thus eliminating the need for a ladder. Takes slightly longer than average to recharge. Poor customer support e.g. info on warranty not readily available. (1) Improved flexibility: Unlike petrol or electric-powered units, battery-powered pole hedge trimmers are light in weight and, therefore, easy to maneuver. (2) Better Batteries: Rapid advancement in technology has meant that the recharge and run time of these machines have gotten better over time. (3) Machines: Cordless machines are by design quieter because they’re designed to maximize on the power stored in the batteries. Typically, well-made trimmers produce noise equivalent to that of a conversation 3 feet away. (4) Replaceable Batteries: In addition to the enhanced battery life, cordless trimmers offer you the ability to interchange the batteries when necessary. You can, therefore, purchase a spare battery for an extended run time. Hedge trimmers are an essential tool for lawn maintenance. You need to take into account various factors when buying a cordless pole hedge trimmer including voltages, battery longevity, blade length and trimming features. A good trimmer should conserve your energy, time and money. Before purchasing a trimmer consider the level of difficulty of the job. Check the lawn size, height of the hedge, the diameter of the branches to be cut among other factors. The size of the trimmer has to match the lawn size. A small machine will handle a small lawn well while a big lawn requires a bigger device. You also need to know the height of the hedge and what kind of plantations need to be cut. Standard trimmers are designed to cut branches that are about half-inch in diameter. Larger branches will require bigger sizes to suit their diameter. Big, hard to cut branches will require a powerful motor. If you are buying a tool for commercial use, then you need a powerful motor that can take care of all types of jobs, including hard ones. While deciding on the motor, consider if the motor runs quietly or it is noisy. Check the lock to see if it has a safety feature, and also if switching on the machine and keeping it running is easy. Avoid trimmers which require the operator to hold onto the lock to keep the trimmer running. Check how the rotating blades work. Machines with smooth stainless steel blades should be preferred. It is important to trim tall hedges and reach every area that needs to be cut. Check the length of the pole. Also, find out how many cutting positions are on the pivoting head. In addition, consider the battery charging time and running time. A higher running time will ensure that you trim conveniently without the need to recharge. Also, the weight of the machine will determine user-fatigue - the lighter the trimmer, the better. Considering factors such as convenience, quality, ease of operation and durability, our experts arrived at Greenworks 20-inch as the best cordless hedge trimmer in 2018. It has a superior cutting ability, strong blade, powerful blade and above all an adjustable head for multi-angle trimming. The second best choice for us was the Black+Decker 22-Inch LPHT120 which amazed us with its strong lithium-ion battery and the ability to operate quietly. You no longer have to stretch and strain your muscles to get two hands on the job. 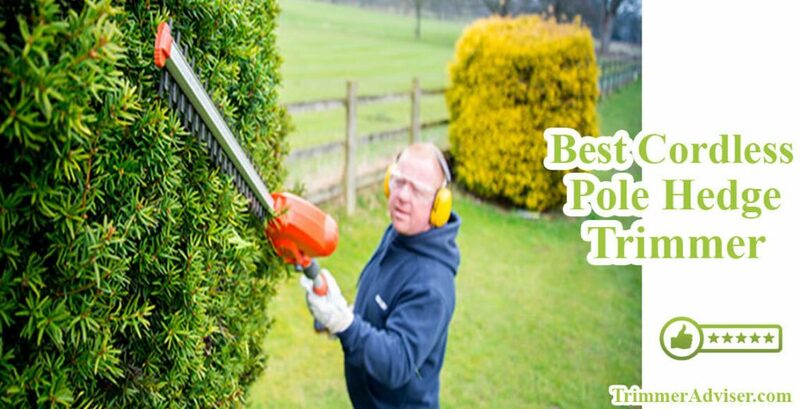 The best cordless pole hedge trimmers have already got that need covered for you. So, all you need to do is find the best-selling choice in town, listen to the expert opinion before finally making an informed choice. Best Cordless Hedge Trimmer: 2019 Top 11 Selling Models!